Urdu is an Indo-European language from the central zone of the Indo-Aryan branch, with over one hundred million speakers worldwide. Once associated with the Mughal Empire, it is most prominent in Pakistan, northern India, and South Asian diaspora communities. 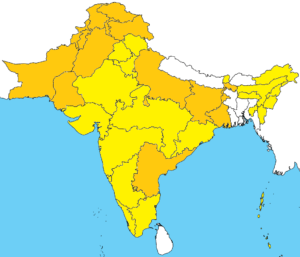 Urdu is the official language in Pakistan and some states of India (marked in dark orange; marked in yellow is Hindi). Due to its mutual intelligibility with Hindi, Urdu and Hindi are often referred to jointly by the term Hindustani (literally: “from the land of the Indus”). Considering Hindustani as a single unit, it is the third or fourth most spoken language in the world, depending on which source you look at. People often ask what the differences between Hindi and Urdu are, and I would say that there are essentially two. First, the writing system: Hindi employs the Devanagari script, which is a descendant of older Indian scripts, whereas Urdu uses a version of the Perso-Arabic script, which came into use for several South Asian languages after Muslims entered the subcontinent. Second, while the grammar and syntax for both is alike, higher-level vocabulary in Hindi is derived from Sanskrit while in Urdu it is often derived from Persian and Arabic. In regular conversation, though, Hindi and Urdu speakers can communicate with each other perfectly well. Due to the partition of the subcontinent in 1947, the differences between the two have been artificially magnified in Pakistan, where Urdu has national status, and India, where Hindi has national status, in quite a politicized manner. Anyways, Urdu is known for its great canon of literature and poetry; figures such as Meer, Ghalib, and Iqbal have truly inspired millions. It makes sense that Urdu is a poetic language when one looks at the rich sources it draws from – it is built on a foundation of Sanskrit and Hindi, and ornamented with vocabulary from Persian, Arabic, and even Turkish. Interestingly enough, the word Urdu is even synonymous with poetry in some cases. For example, take a look at the super-hit Bollywood song “Chaiyya Chaiyya” from the 1999 movie Dil Se. Skip to 1:28 and you’ll hear the line “Woh yaar hai jo khushboo ki tarah, jiski zubaan Urdu ki tarah”. This would translate to “My beloved is like a sweet aroma, whose words sound like Urdu”. There are also many pairs of rhyming words that are connected by a similar theme, and while they aren’t necessarily exact opposites, they are distinct. 2) This is probably my favorite characteristic of the Urdu language. Many verbs are part of families (usually 3-4 verbs) that use a root verb to derive causative versions of it. Take a look at the examples below to see what I mean. The infinitive form of every Urdu verb end with the suffix “-na” (نا-), just as every English infinitive begins with “to”. Yeh darwaaza khud khulta hai (This door opens by itself). Tum ne is darwaaze ko kholna hai (You need to open this door). Is darwaaze ko kisi se khulvaana hai (Someone must be brought to make this door open). 3) Urdu also has the interesting feature of having rhyming series of certain pronouns and adverbs. As you can see, there is a pattern, such that the first one always has to do with something removed from the present situation, the second has to do with something related to the present situation, the third is used for general statements applicable to any situation, and the fourth is an interrogative word for an uncertain situation. 4) Like many languages, Urdu has a rich vocabulary, but there is a focus on poetic and romantic words. There exist multiple words for things that have only one word in other languages like English. The reason for this is that some words have South Asian etymologies, while others have Central or Western Asian origins. I hope that those who are interested in the study of languages enjoyed this post. Please feel free to comment below to ask any questions you may have about Urdu.